In the previous issue, we looked at strengthening our glutes, abs and leg muscles. In the last article of this series, we look at strengthening our biceps and triceps and related exercises. TTT: Hi Prem. What are we going to look at this time on our journey to fitness? PM: We have done a few articles on home training so far. Today, specifically, we will be looking at using dumbbells as a simple way of training at home. TTT: That’s nice. This will definitely benefit those who cannot afford a good gym as well as those whose timings do not allow them to join any regular fitness training. What is the first exercise that we will look at? PM: Before we start with the various positions, I must tell you a little bit about dumbbells. Earlier, dumbbells were made completely of iron. Today’s dumbbells have a steel grip with rubber coated ends to avoid damage to the flooring in case of any mishap. They come in various weight categories, starting from 2.5 kgs going up all the way to 20-25 kgs. Beginners should definitely start with the lower end weight categories (consult with your trainer about what entry level weight you can manage) and then gradually move up as you develop stamina. Start with around 6-8 repetitions and slowly graduate to a higher number. Remember that these exercises should not be done more than twice a week. Doing them more frequently will result in you damaging the muscle as well as breaking the tissue. The first of the positions is the Biceps Curl. Also known as a Dumbbell Curl, it is a basic beginner movement. Stand with your feet about 4 inches apart with your spine erect and your neck in a neutral position looking straight ahead. 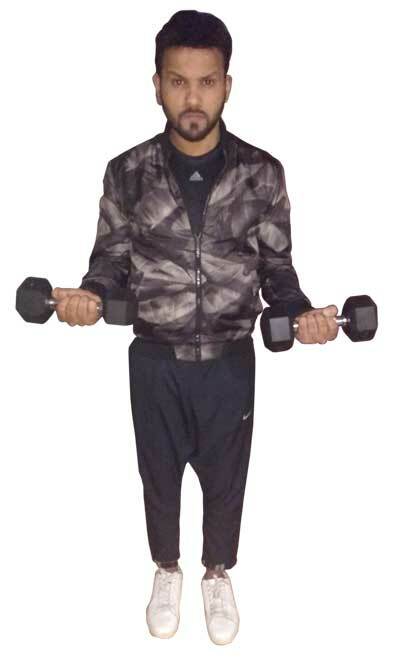 Keeping your arms to your side, lift both dumbbells in a synchronized manner starting with your hands straight along your sides with the wrists facing outward. Raise your forearms slowly such that they create a 45 degree angle with your arms, all the time keeping your arms close to your body. The only movement should be at the elbow joint. When you bring the dumbbells down, make sure that this is done slowly so your muscle is under continuous tension throughout the movement. Breathe in when you raise the dumbbells and breathe out when you lower them. This curl strengthens your biceps and forearms. Strengthening Squats & Powerful Push-ups Prem Mehta looks at the health benefits of squats and push-ups in this edition of Get Fit, Stay Fit! Beat the heat and stay fit Any exercise will induce sweating and depletion of body salts at any time of the year; in the heat, the quantum you sweat increases tremendously.